Kenya is still the primary focus of all adventure travel in Africa. It is one of the finest--and undoubtedly the most famous--safari destination in the world. 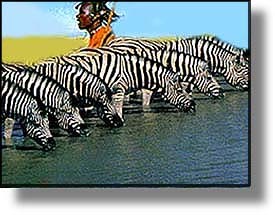 Safari, however, is by no means the only reason to visit Kenya, for the attractions of its rich culture and diverse environments are considerable. Although Kenya's varied environments experience a wide variety of climate conditions, the temperature remains comfortably warm year-round. Much of Kenya experiences heavy rainfall from March through May and, to a lesser extent, from October through December. The best time for most outdoor acitivities (including safari and mountain climbing) is during the dry season (June-September). With the arrival of the Portuguese at the end of the 15th century, the East African coastal region was for a time dominated by the Europeans. However, in 1729 the Portuguese were expelled, to be replaced by two Arab dynasties. Arab rule lasted until the end of the 18th century, when Kenya passed into the British sphere of influence. The country became independent in 1963. Although it has experienced its share of internal and external strife, Kenya has in recent years been moving toward a more stable, multi-party political system. 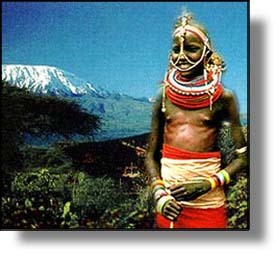 Kenya's population is overwhelmingly (97%) comprised of people of African descent, though that group is composed of over 70 different tribal groups. Among the most significant are the Kikuyu, Kamba, Gusii, Luhya, and Luo. Kenya's primary languages are English and Swahili, though regional tribal languages abound. This page, and all contents of this Web site are Copyright (c) 1997-2007 by InterKnowledge Corp. All rights reserved.